ACE Telecom was among the first in the world to experience the simple, user-friendly installation of Integra. In late 2013 SAF Integra replaced Lumina in one of the western districts of Budapest and the first Integra was introduced to Hungary. ACE Telecom provided internet connection during the European Figure Skating Championship 2014 where Integra was installed on the roof of Syma center, a multi-purpose event arena. “The almost half a gigabit backup data transfer was very helpful when it came to maintaining the stability of the network without interruption. ACE Telecom is a Hungarian WISP that supplies their business customers with high-quality internet-based services. SAF Tehnika backbone covers almost the entire area of Budapest and services are available in the region of approximately 40 km of the capital as well. ACE Telecom was introduced to SAF Tehnika’s products by our partner AccessPoint in Hungary. AccessPoint is a data transmission equipment distributor whose main customers are local internet service providers, cable TV operators, system integrators and security companies. experienced an unusual mix of cold and thaw in combination with strong winds and overall harsh weather. 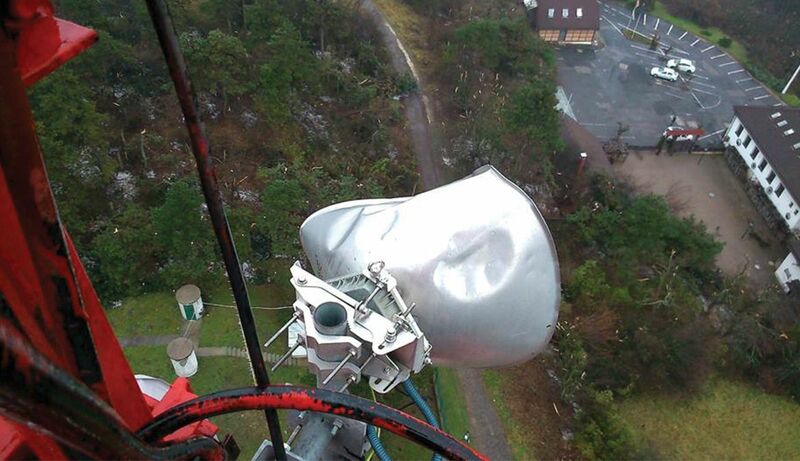 Large chunks of ice built up on a few towers that ACE Telecom was using for the deployment of their microwave radios. On one of these towers, large ice rocks disintegrated from the tower and fell down hitting the wireless equipment on its way. One of the radios that took most of the damage was SAF’s Integra (see picture above). Despite the vast damages, Integra stayed operational so that the engineers were able to replace the damaged equipment without long, unexpected interruptions in the site traffic. SAF was chosen for the project, because of its superb broadband connectivity. It paid-off for the customer, because, despite the heavy damage the Integra stayed operational. Thus, the engineers had the time to work out a plan for exchanging the damaged parts without taking emergency measures. One of the reasons for creating the Integra series radios was to provide controlled highest possible build quality for both – the radio part and the antenna. For that reason, SAF combined those both elements into a single solution making the Integra one of the most durable and highest-performing microwave radios on the market.